#KwaleNiNasa Raila and NASA Team in Kwale promising to end the Social and psychological injustices. - Bana Kenya News, Real African Network Tubanane. Home featured Mombasa #KwaleNiNasa Raila and NASA Team in Kwale promising to end the Social and psychological injustices. #KwaleNiNasa Raila and NASA Team in Kwale promising to end the Social and psychological injustices. 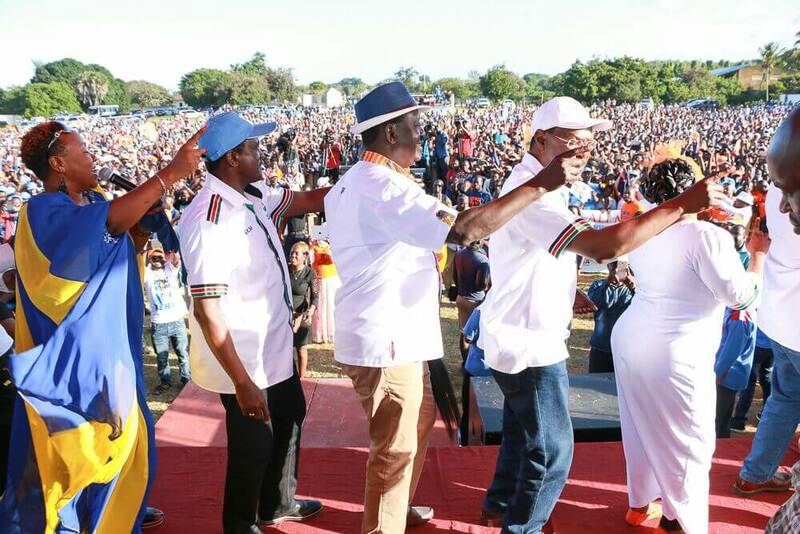 Raila Odinga was in Kwale today for a two-day visit to the coast. The visit was cut short with the demise of the Interior CS Joseph Nkaiserry. The Opposition is determinant to get all the Coast votes in the General elections. In the NASA team accompanied Raila in Kwale, Mombasa governor Hassan Joho, ANC leader Musalia Mudavadi, Siaya Senator James Orengo and Ford Kenya Moses Wetangula and Wiper Leader Kalonzo Musyoka. "Kwale County will boost our campaigns and spread the change message in the County and entire Coast region. We are determinant that August election will be held with full of expectation." ANC leader Musalia Mudavadi explain. "Our NASA change brigade is back at the Coast. Today we were in Kinango where we discussed the long deferred promises by this country to its citizens at the coast. I see it in their faces and hear it in their voices. The Coast is clear in their resolve. They are not willing to live through another period of broken promises. We hear you Kwale! Nane Nane is the day of change." Said Odinga. "The people of the Kwale need to wake up very early to vote in the August elections for NASA because Jubilee and their gods have deteriorated the life of its citizens. Land grabbing has been rampant in Kwale. From Waitiki, Kikoneni to Shimba hills, we need to end this disease through your vote. Tourism will be back as it was in the past in my regime. NASA will make sure that all arms of Government are working." Added Odinga.